There is something that almost feels magical about turning onto the drive off Sumter Avenue. The smooth corridor is lined with majestic oaks, is bordered by beautifully manicured shrubs and flowers, and is timelessly elegant, easily leading one to envision well-dressed Summerville ladies of the early 19th century arriving by carriage for an afternoon tea. The air is scented with the delicate fragrance of gardenias and water falls gently from the fountain set in a flagstone walkway leading to front steps of one of the town’s oldest and most gracious homes. The beautiful scene enjoyed today bears little resemblance to what Dr. David Price encountered when he first turned down that drive in the late 1960s at the invitation of a friend asking advice about at the old house he was considering buying. Stationed at Charleston Air Force Base and known for his interest in history and architecture, Price agreed to drive out and take a look. “It’s a good house,” Price told him, his eye for architectural design recognizing the clean, simple lines of the white frame house with the wide front porch, and the potential within it. It would be close to a decade before he thought of it again. Price left the Air Force and Charleston with fond memories of the area, but no real thought that he would ever return. When he began his search for a location for his new ophthalmology practice in 1974, he had two criteria: a vibrant community in which a new practice could grow and thrive, and a historic home he could restore. Friends in Charleston suggested he look in Summerville. Fresh from Duke University Medical School, Price once again made the drive out to Summerville, turning onto a drive off Sumter Avenue. This time, it was in the company of realtor Sonny Waring that he made the trip down a long winding driveway. There was something about the oak trees lining the pathway that felt familiar, something that felt strangely like he was coming home. 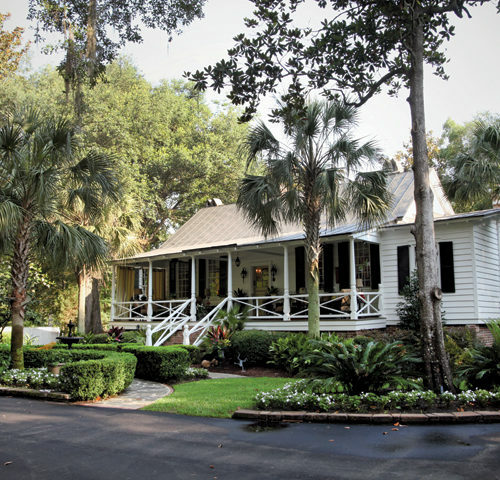 Though the first Summerville conveyance of land on record is dated 1828, the house is thought to be the town’s second oldest, dating back to around 1812. Whether it was luck or providence that eventually brought the property into Dr. Price’s line of sight, there is no question that it could not have fallen into the hands of a better steward of both its physical and historical essence. Price immediately began a painstaking restoration of the house. Bit by bit, plaster was restored, bricks repointed, windows re-glazed, and woodwork stripped to bare wood. 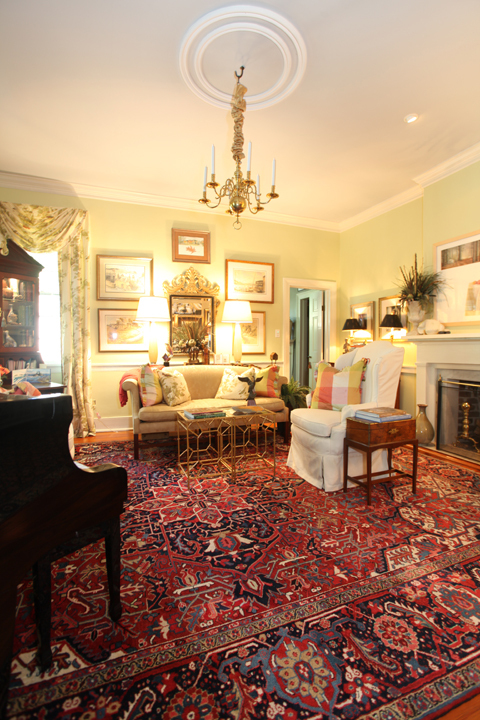 Years went by and word of the thoroughness of the restoration spread among the historic preservation community, offering Price access to expert artisans experienced in the standards required for recreating the kind of historical accuracy the house deserved, who were also pleased to be involved in the work. When David and Jennifer Price were wed in 1992, his new bride, a surgical nurse, also brought a degree in interior design to the table. 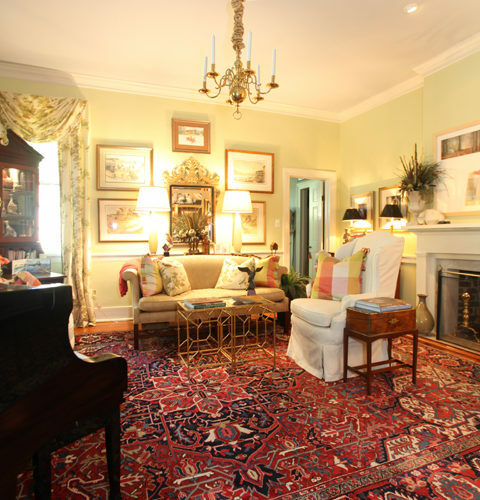 Through the years, it has been her exquisite taste and discerning eye that have helped bring the house to the state of grace it currently enjoys. 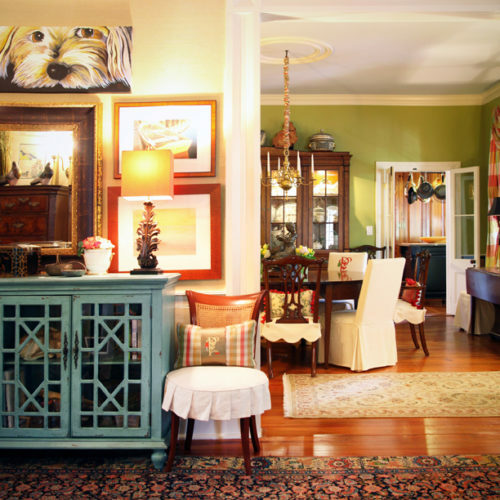 Her designs have made the most of every nook and cranny, incorporating the house’s six working fireplaces, creating space for a laundry area, his and her baths, an office for David, an inviting room for guests, and a serene white oasis for the master bedroom. 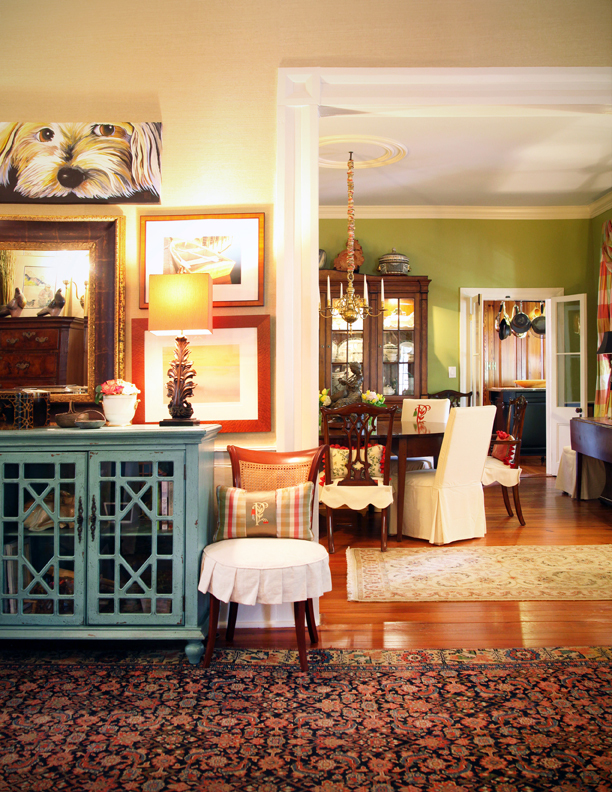 Light filtered through the central hall’s nine-over-nine windows, as well as six-under-six windows throughout the rest of the house, highlight the couple’s eclectic collection of paintings and sculpture, gathered on their travels or created by artist friends made through their many years of association with Sculpture in the South. Chandeliers lit by actual candles in the living and dining rooms are a lovely reminder of the history reflected in the soft glow of their illumination. Chair covers and pillows wear monograms of corals and creams, and richly colored walls bring each room’s detail into beautiful focus. It is Jennifer’s love of the garden that has wrapped the house in a leafy shawl of vibrant colors and textures, and no corner of the beautiful yard has escaped her attention. Brick and flagstone pathways meander past sago palms and through lush lawn to outbursts of foliage in every shape, size, and color. From the back deck, glorious plantings of greenery leads to a hidden outdoor dining room, with hanging baskets of orchids and ferns lending a cool, tropical feel. On the opposite side, a guest cottage sits nestled among hardy cast-iron plants and blooming hydrangeas. 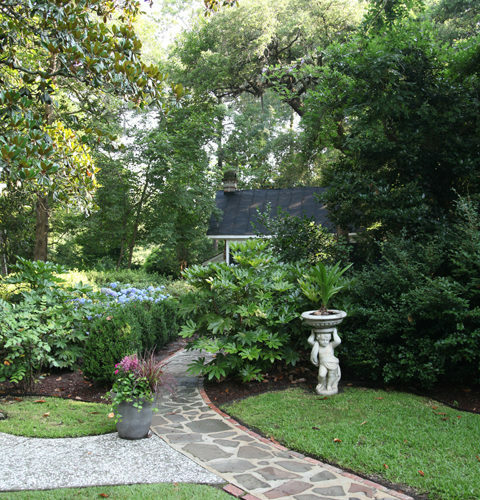 It comes as no surprise to learn that the yard will soon be used in a photo shoot for a garden catalogue. It took extraordinary far-sightedness to look past the house with the brown paneling and sparkly popcorn walls, to see what could be, and to make that vision a reality. 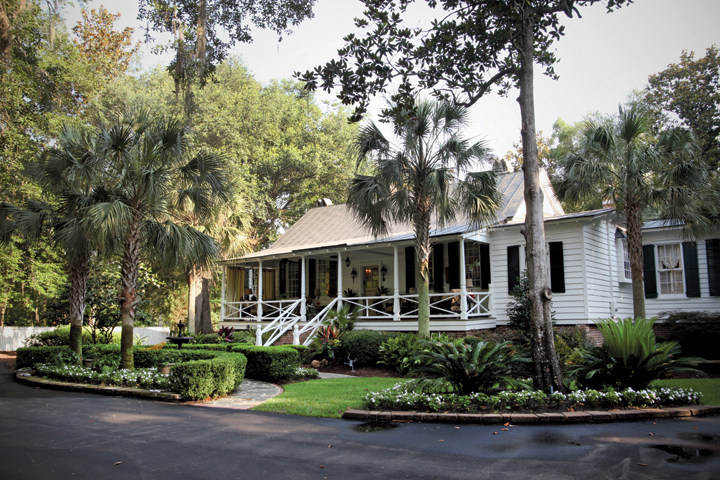 Countless hours of hard work, patience, love and care created this place that David and Jennifer Price hold up as their gift of love to those who long ago looked out this home’s windows to see a town beginning to grow amidst the sandy soil and pine woods of Summerville. 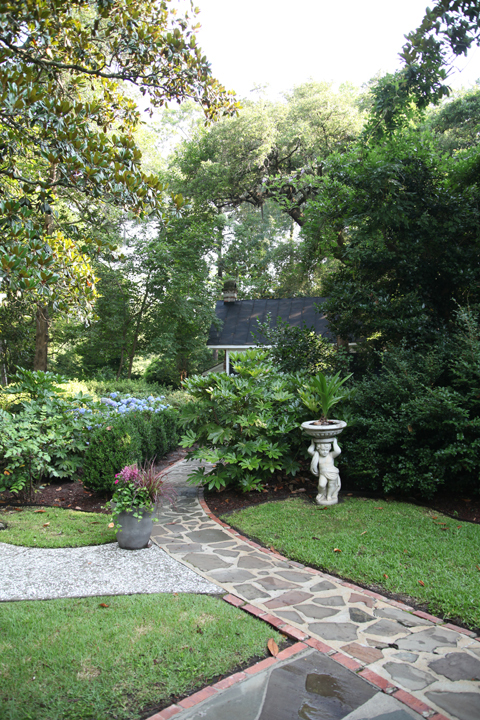 It might just be their celebration of the gift they have been given that adds the almost-magical feel to turning into the long and winding drive off Sumter Avenue, to the home in the garden.